Of course this list isn't exhaustive. 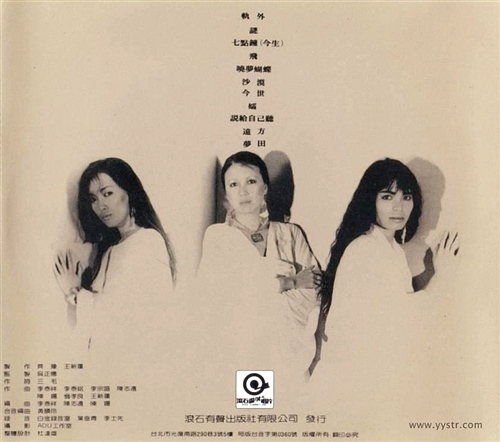 From the top cover of Echo Chyi Michelle (Echo by Chyi and Michelle) CD, both Chyi and Michelle Pan shall be known to most people who know Mandarin or at least could converse in Mandarin. However, I reckon that many do not know "San Mao" (Chen Ping) whose pseudonym is directly translated as "3 Hairs". Let me branch out a little bit for those who could be interested to know more about San Mao. http://en.wikipedia.org/wiki/Sanmao_(author). I have got the very 1st press which was manufactured / pressed / made in Japan. I actually used to own the cassette back in late 80’s and managed to pick up the CD from Salem Power Station located in LOT-10. That was really long time ago! In fact I never knew it till some fine day of late when my friend told me of his current purchase of the same album which sounded poor as compared to the CD-R I burnt for him from my 1st press original copy. 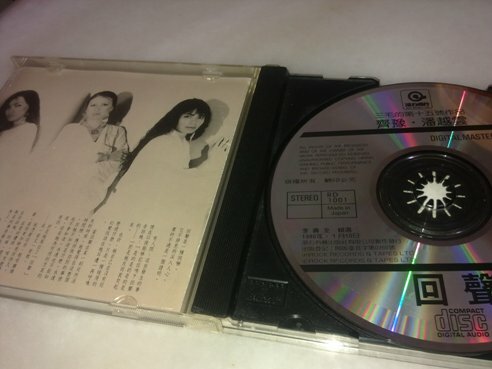 See, I told you Echo Chyi Michelle (Echo by Chyi and Michelle) CD was manufactured / pressed / made in Japan! 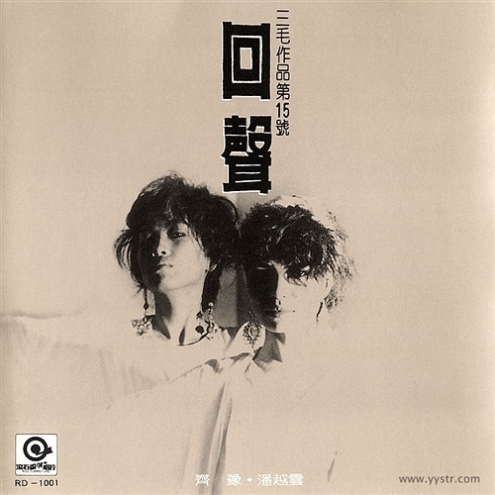 This album is made up of 11 songs which lyrics were written by San Mao while the tunes and arrangements were produced by a few famous Taiwanese artists. These 11 songs have been stringed chronologically as a complete music biography describing the good part of her life. The fine and delicate changing mood depicted therein is very much the life of the music. The indubitable interpretations of Chyi Yu and Michelle Pan, be it in the form of duet or solo, coupled with the most expressive narratives of San Mao have apparently elicited different moods when San Mao encountered different experiences at the few stages of life. This is indeed a unique music biography which paints the colorfully touching true stories of San Mao! Chyi Yu's delicate angelic vocal sounds like coming from heaven while Michelle Pan's slightly nasal vocal of deeper pitch makes the missing jigsaw part of the duets. In other words, I must claim that their duets with well trained harmonic singing techniques are undeniably heavenly!!! Whilst tracks of single vocal do argue for their very own rights with special mention that Michelle Pan's vocal is, among all Chinese / Mandarin female vocals, the most feminine one to my heart! Don't ever expect that this album is not HIFI-ably demanding, check it out yourself!!! But with your music reproductive setups capable of projecting sonic pictures together with the intangible yet most vivid mood captured in chronology, you could certainly experience a COMPLETE BIOGRAPHICAL SHOW WITH THE MOST ARTISTIC MUSIC! You reckon it incomplete should I highlight just some tracks to sample? Should you listen from Track1 to the last? You know the answer now! Post script: Knowing that San Mao had taught Mafalda and few other kids to speak in Mandarin, I sincerely wish that San Mao had also taught them to play music as I trust that they would sing to my heart in the most innocent way! Sorry for another "branch-out" http://dannii.cn/mafalda/.